Before starting your first analysis, take a moment to explore the elements of the graphical user interface. The elements in the workflow bar at the top of the screen help you navigate through the workflow and give access to application-wide options. 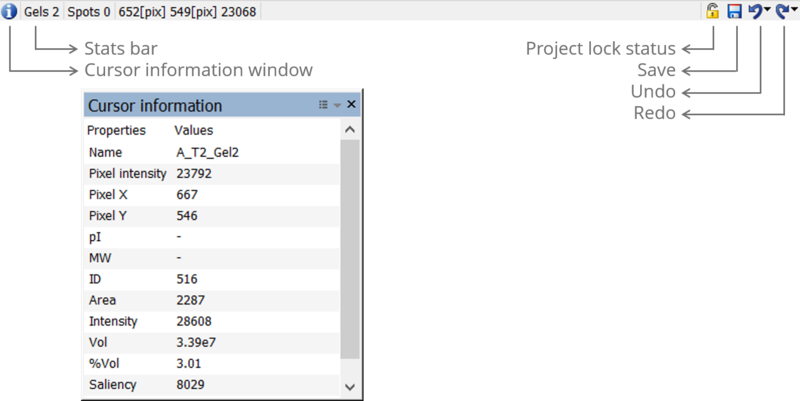 Click the Project icon to create a new project, open an existing project or view the project properties. You can also export your project, project data or project images, and copy an image, the Display area or the entire application window to the clipboard for use in other programs. Navigate back and forth between the workflow steps using the Next and Back arrows. Alternatively, you can directly switch to a workflow step by clicking on it. Only workflow steps in blue are enabled (clickable). Workflow steps that are not yet enabled are displayed in gray. Click the Close project icon to close the current project and return to the Project screen, where you can create, manage and open projects. Click the Help icon to display brief contextual help about the current screen. The help message provides a link to more complete documentation on our website, or – if you work off-line – a locally installed copy. Click the Options icon to access the General options (applicable to the entire application) and Workflow options (applicable for certain workflow steps). Click the Image view icon to enter the Image view mode. This mode is accessible from all workflow steps. It allows even more flexible image visualization, letting you choose only certain images to look at. The various steps of the analysis are summarized below. Melanie provides the necessary feedback to optimize your image capture procedures. Potential issues are highlighted and information provided on how to solve them. When required, re-scan gels or edit images. Then validate the images you want to take forward for further analysis. Experimental design Define the experimental design variables. Use the Experimental design wizard to create one of the common designs, name factors and factor levels, and assign images to the different treatments. Specify additional experimental variables that you might want to investigate, and verify if you have a consistent and balanced experimental design matrix. Alignment setup Specify your alignment strategy. To increase alignment efficiency and minimize match editing work, you can first align images within groups of similar images. The different groups are further matched by aligning their respective reference images. Group your images based on factors defined in your Experimental design, or build your own group hierarchy. Then specify the reference images and reference groups for alignment. Align the images in your alignment hierarchy, systematically review each alignment pair using the dedicated tools, and edit matches where necessary. 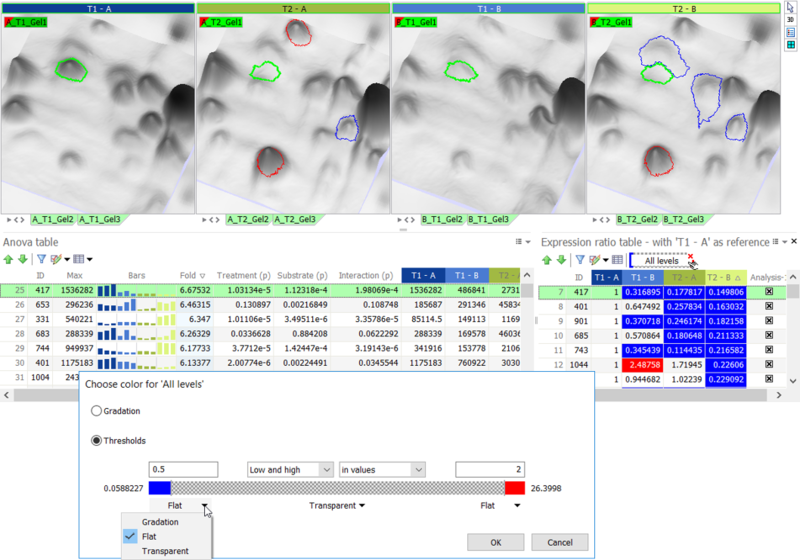 Fine-tune the automatically calculated detection parameters and choose the images to be taken into account for the generation of a representative spot pattern. Review Review spots and normalization. Review the spot pattern, possibly editing spots or making corrections in the alignment. 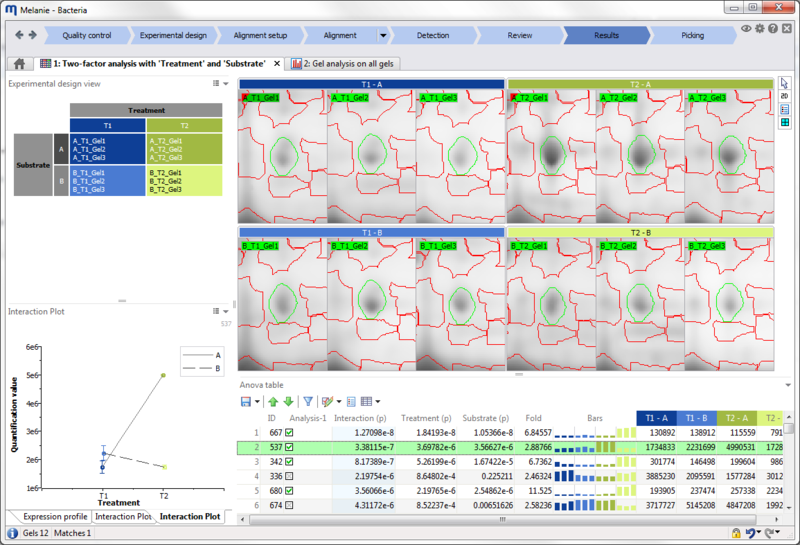 Select spots using the advanced selection criteria in the spot filter, to include or exclude them from further analysis. Review the normalization before continuing with the statistical analysis. Melanie automatically proposes dedicated tools and statistical tests adapted to your experimental design. Filter your spots based on selected fields in your tables, tag them using spot sets, and validate spots by using the various plots and viewing options. Picking Choose and export spots for picking. Pick spots for picking and further downstream analysis. The Display area is where the image views are shown. You can manipulate and customize these views using the different options in the Toolbar at the right of the Display area. The Mode icon lets you pick the desired tool for manipulating your images. You can work in Move, Zoom, Select, Measure, Align, Pick or Edit pI/MW mode. Some modes are not available in all workflow steps. Move image Hold down scroll wheel and drag. Double-click scroll wheel to re-center on an area. Ctrl + Hold down scroll wheel and drag. Zoom image Roll scroll wheel. Roll scroll wheel. Rotate image – Hold down scroll wheel and drag. Set peak height – Ctrl + Roll scroll wheel. Note how all images move/zoom/rotate simultaneously once images are aligned. To manipulate only one image at a time, hold the Shift key while carrying out the desired operation. To synchronize your image views again, zoom in or out on your image without the Shift key, or double-click the mouse scroll wheel. Choosing a different mode will allow additional manipulations with the left and right mouse clicks. These are summarized in the following tables. Move image Left-click and drag. Double-click left button to re-center on an area. Left-click and drag. Set peak height – Hold down right button and drag up/down. Zoom image Left-click to zoom in. Right-click to zoom out. Left-click to zoom in. Select spots Left-click on spot to select. Right-click on spot to deselect. Left-click and drag to select spots in area. Right-click and drag to deselect spots in area. Right-click in background to deselect all. Left-click on spot to select. Right-click in background to deselect all. Measure distances Left-click and drag to measure horizontal and vertical distances. Left-click and drag to measure horizontal and vertical distances. Select/edit matches Left-click on match to select/create. Right-click on match to delete. Right-click and drag to delete matches in area. Right-click in background to deselect all. Left-click on match to select/create. Select spots to pick Left-click on spot to select. Right-click and drag to deselect spots in area. Left-click on spot to select. Select marker Left-click on pI/MW marker to select. Right-click in background to deselect. Left-click on pI/MW marker base (cross) to select. Right-click in background to deselect. Edit marker Double-click to create/edit pI/MW marker. Drag base (disc) to move pI/MW marker. Right-click and drag to delete markers in area. Double-click to create/edit pI/MW marker. Drag base (cross) to move pI/MW marker. Right-click and drag to delete markers in area. Rotate – Left-click and drag to rotate. Contrast – Left-click and drag up/down to change peak height. Z position – Left-click and drag up/down to move the entire 3D view vertically. 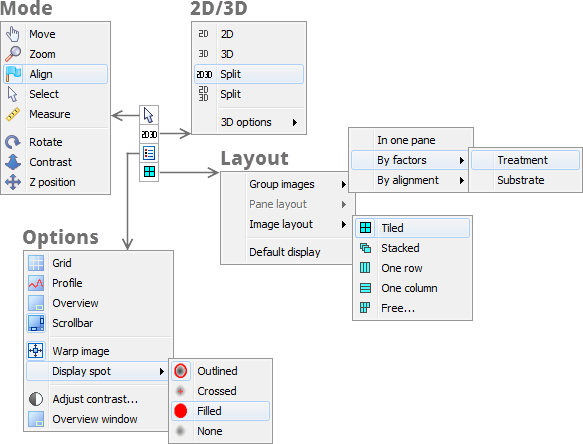 Click the 2D/3D icon to choose different combinations of 2D and 3D views for your images. If 3D views are included, there will be further options for the display of the 3D view. Various tools and options are available to adapt the default views to specific needs. Grid – Display a grid over the images in the 2D view. In combination with the Warp option, the grid helps you visualize the deformation in your images. Profile – The profile helps explore spot shapes in the 2D view. When this option is activated, transparent curves represent the intensity variations of the gel in the vertical (right) and horizontal (bottom) directions at the position of the mouse cursor. White lines indicate the exact position of the cursor, with the corresponding pixel gray level in red. The gray numbers indicate the minimum and maximum gray levels in a specific profile view. Overview – Show the currently visible area on a small overview of the entire image. Scrollbar – Show or hide the scrollbars. Warp image – Warp the aligned image in the 2D and 3D views so it superimposes perfectly with the reference image. Adjust contrast – Adjust the contrast of images. Overview window – Display a separate window to show the currently visible area on an overview of the entire image. Depending on the workflow step, related images are grouped in containers that are called panes. Click the Layout icon to group your images differently, change the layout of the panes in the Display area, or the layout of your images in the panes. Note that some of the options are not available in all workflow steps. In one pane – All images are displayed in a single pane. 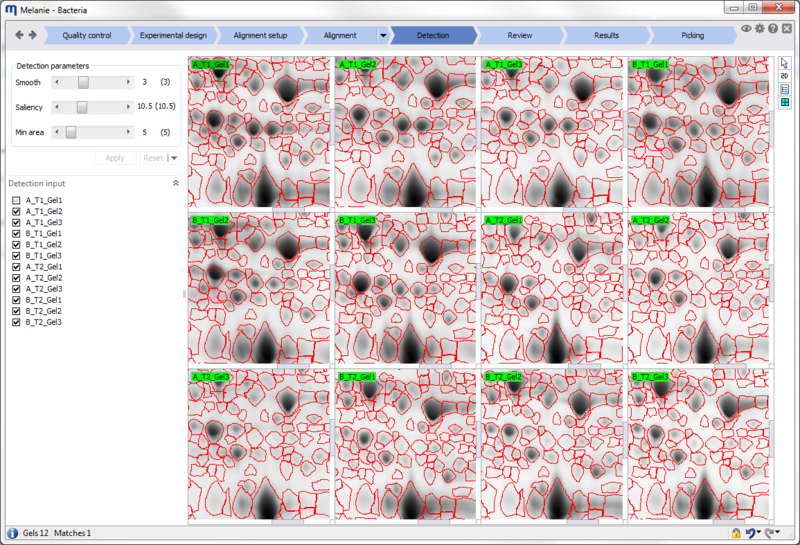 By factors – Images from the same factor level are grouped within a pane. By alignment – Images from the same alignment group are grouped within a pane. By DIGE – Images from the same DIGE gel are grouped within a pane (only for DIGE experiments). 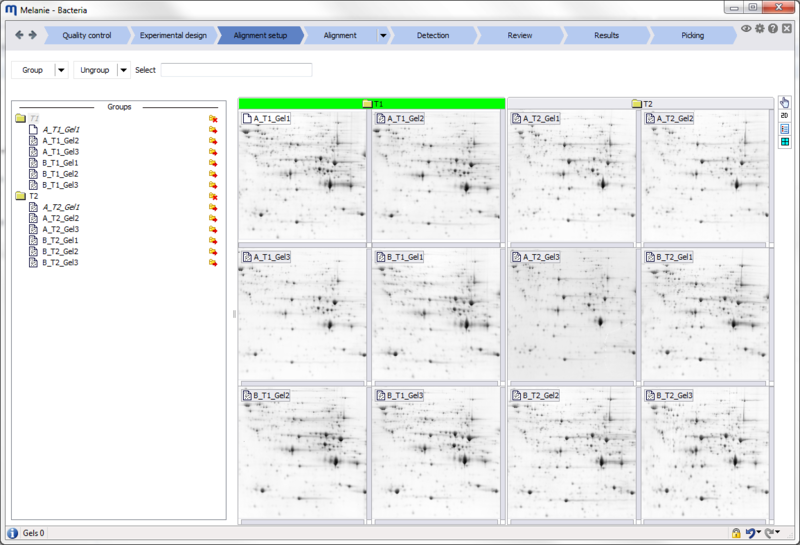 By dye – Images using the same Cydye are grouped within a pane (only for DIGE experiments). Stacked – Panes/images are one on top of another. Tiled – Panes/images are side by side. One row – Panes/images are in a single horizontal row. One column – Panes/images are in a single vertical column. Free – You specify the number of panes/images laid out horizontally and vertically. The status bar gives access to some useful tools. Click the Cursor information icon to display the Cursor information window. It displays information about the pixel and spot you hover over with your mouse cursor. You can show additional properties or hide some of them by clicking the Settings icon in the Cursor information title bar. The Status bar indicates the total number of images and spots that are currently selected. If you move your mouse over a gel image, the Status bar also indicates the X and Y coordinates at the cursor position, as well as the pixel intensity (calibrated). The unit of the coordinates can be changed in the Display tab of the General options. Click directly on the Undo or Redo icon to undo (or redo) the last operation. Click on the arrow next to the icon to get access to the list of all operations that can be undone/redone. The Project lock icon tells you whether your project is locked for editing. Projects get locked once the images are aligned and detected. Editing them in any way will require you to confirm that you effectively want to carry out the requested operation and are aware that this will make you loose your results (validations, or even alignment, detection or normalization, depending on the step where you want to make a change). Save modifications – Save all modifications carried out in the current workflow step, since the last save operation. Reset modifications – Cancel all modifications carried out in the current workflow step, since the last save operation. The step-specific tools and views are mostly displayed at the top and/or left side of the software screen. They will be specifically documented in the sections of the User Guide corresponding to each workflow step. Several of the step-specific tools are reports, for which the common features are described below. Reports describe your analysis data. They may be in table format, but can also be graphical representations of data such as normalization plots, expression profiles or PCA plots. The report content is continuously updated, and selections in reports are synchronized with the gel images and other reports. The reports in Melanie share a large range of common functionality. At the right of each report title, you will see the Options icon. Depending on the report, you will find options here to export your report, change column settings for tables, or modify display options for plots or histograms. Click Save to file to save tables in tab-delimited Text format (.txt), as Excel Workbook file (.xlsx), as Excel 97-2003 Workbook file (.xls) or in XML format (.xml). Graphics can be saved in PNG, TIFF or BMP formats. Click the Print icon to print the report. For tables, you can choose whether you want to include only selected rows in the printout, or all rows. Melanie shows a Print Preview where you can change options (layout, include/exclude background colors, headers/footers) before printing. Choose Copy to clipboard to export your data into another application. Paste directly into the preferred software. Click the Column settings icon to set the visibility and order of your columns. In the toolbar of the Column settings window, you can Load a predefined template or Save your own template indicating what columns should be hidden or shown. The availabe display options are proper to the specific plot or histogram and are described in the section describing the report. The toolbars of the reports in Melanie share a series of common tools. Click the Previous Selection icon to skip to the first selected item encountered when scrolling towards the top of your table. When only one row is selected, this selects the previous row in the table. Click the Next Selection icon to skip to the first selected item encountered when scrolling towards the bottom of your table. When only one row is selected, this selects the next row in the table. Select items in the report based on one or several numerical filter criteria. Click the Filter by values icon, choose the measure (i.e., column) you want to use for refinement, and set the lower and/or upper limits of your search interval. When you add additional criteria, you can specify the operator used to combine the criteria. Choose the output for your filter as being the new Current selection, a New spot set, or one of the existing spots sets. The first one is by creating a collection of spots that belong together based on a specific criterion. Such a collection of spots is called a spot set. For instance, you can create a spot set ‘Fold>2’ for all spots that have a Fold change higher than 2. This means that all spots in the set are tagged as belonging to the spot set ‘Fold>2’. The second option is to label spots individually with an annotation. Annotating a spot means that you give it a specific label that belongs to a certain category. For instance, you can annotate each protein spot with it’s accession code in a protein database. 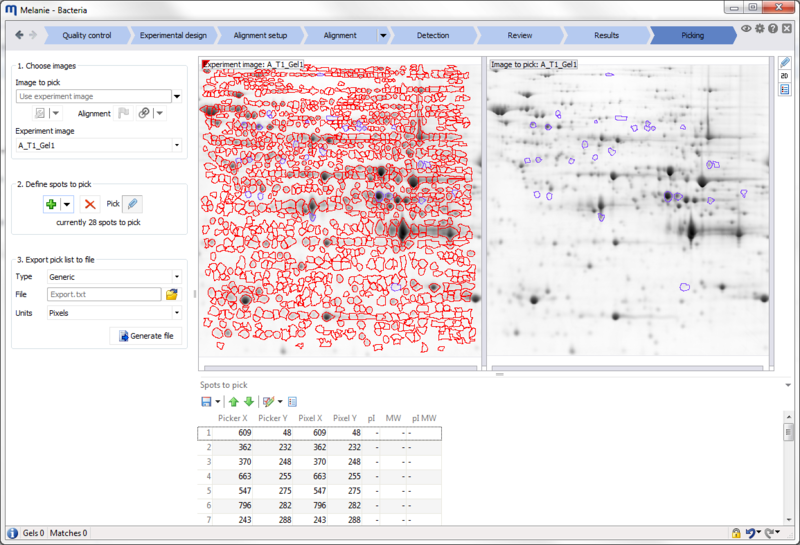 Every protein spot will have a specific label – in this case an accession code (e.g. P12345) – within a category ‘Ac’ for instance. 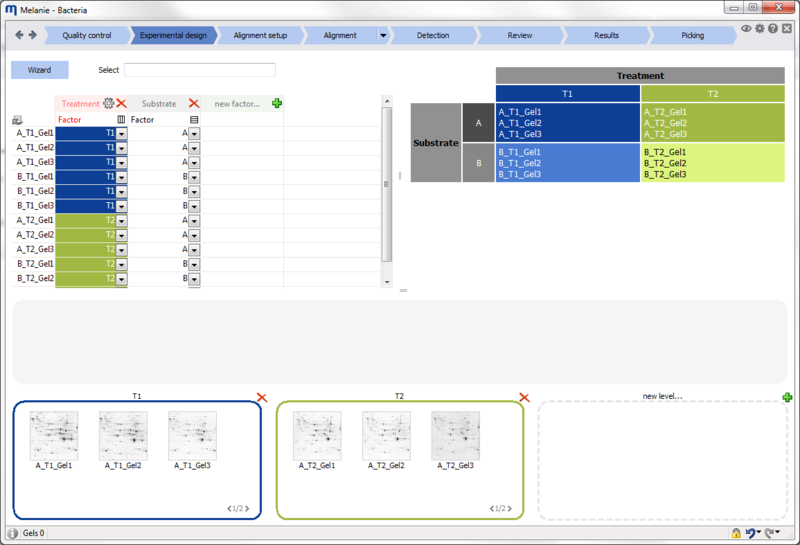 It is possible to focus your analysis on particular spots by creating and saving spot sets for later selection or combination. Spots sets are visualized as columns in various tables. Once a spot set is created, you will see a checked box for spots that belong to the set, or an empty box for spots that do not belong to the set. Click in a box to change its state. If several spots are selected, clicking in one box will change the state for all selected spots. Hover over the name (column header) of a spot set to see a tooltip with information about the set: how it was created, and based on what criteria. If the set has been modified since its creation (for sets created from Combine spots sets), or if the data used for its creation has been modified (for sets created from Filter by values), this will be indicated as well. Create – Select spots you want to include in a spot set, either manually or by selection in a report, and then choose Create. And – Keeps spots that belong to both spot sets. Or – Keeps spots that belong to either one or both spot sets. Not equal – Keeps spots that belong to only one of the two spot sets. Exclude – Keeps spots that belong to the first spot set and do not belong to the second spot set. Delete – Delete a spot set. Rename – Rename a spot set. Select – Select all spots in a spot set. You can annotate a group of selected spots by entering a label belonging to a certain category. Annotations are visualized as columns in various tables. There will be one column for each annotation category. The value for a given spot in that category is the annotation label of the spot. Annotation labels can be edited directly in the table, by double-clicking in a cell of an annotation category. Add/edit label – Click Add/edit label to create a new label or edit existing ones. You will be asked to enter a category for the label. Select one from the list, or enter a name for a new category to be created. Also define the constraints for the new category. Text – Can contain any character. Number – Can only contain numerical values. Auto-Numbering – An incremental number is entered automatically as the new label. Is unique – When you check the Is unique box, you indicate that each label on a gel within the new category should be unique. The software will not accept a new label when an identical one already exists. External engine – To link spots on gel images to protein data in 2-DE or other databases, you can input the appropriate query format (database address and query engine) in the External Engine field of the new label category. If you enter valid database accession numbers as labels, and you subsequently click on a label of such category, the software opens your default Internet browser and launches an HTTP query that takes the form of a Web page address. Delete label – Click Delete label to delete the labels for selected spots. Rename category – Click Rename category to rename a category that you can specify in a list. 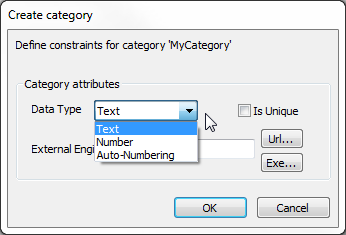 Delete category – Click Delete category to delete categories that you can specify in a list. Select by category – Select all spots that have labels belonging to one or several categories. Select by content – Select all spots for which the labels, in the specified categories, contain a specific search word or character pattern. Import – Import annotations from a tab-delimited text file or XML file containing the required columns ID, Pixel X, Pixel Y, pI and MW. If values for ID are entered, the Pixel X and Pixel Y values can contain ‘-1’ if the coordinates are unknown, and vice versa. Click on the Reports icon to display complementary reports. The new report will generally appear on top of your existing report. You can click on the tabs at the bottom of the table to switch between reports. Click on the small cross at the top right of a complementary report to close it. Right-click a column header to get access to the following options. Choose Best fit to adjust the width of the current column so that all the information in the column shows. The option Best fit all adapts the width of all columns. Click Show group by to group rows according to their values in the column. This is only useful when you have several items with the same value, such as the image Name or spot ID in a Spot table. In the example below, spots are grouped by ID. Right-click the isolated column header in the gray area and choose Hide group by to return to the default table format. Choose Show cumulative histogram to display a histogram of the values in the corresponding column. Click the Measure icon in the report’s toolbar to choose the type of histogram (Histogram, Cumulative histogram, Inverse cumulative histogram or Symmetric cumulative histogram) and to show or hide the Mean and Median values on the graph. The figure below shows the cumulative histogram for the coefficient of variation (CV). When hovering over the plot, you can read the percent of values that have a CV below (or above, for some histograms) the value under the cursor. In the example, about 80% of spots have a CV lower than 0.548077. Click and drag to select a range of values in the histogram. The range is shown in blue. When you release your mouse button, a Filter by values window will display. Click Yes to apply the pre-filled thresholds and select the spots in the corresponding value range on your images and in the reports. Display fitting line – Show the linear regression line through the data points. 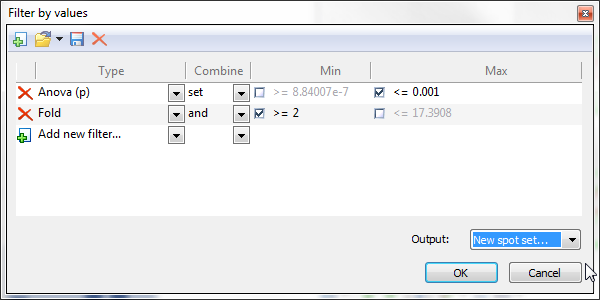 Display fitting equation – Display the equation for the linear regression line through the data points. Force fitting line through origin – Force the linear regression line to go through the origin. You can for instance display a scatter plot of the normalized spot volumes in the Normalization table and show the fitting line and equation (forcing the line to go through the origin). The slope of this linear regression corresponds to the Fitting value that can be found in the Normalization factor table. Values in a column, including those from annotations and spot sets, can be displayed on the images as labels or colors. It is important to note that some columns are special, as they are part of a group of columns. For instance, in the Group table, there is a spot abundance column for each image. In the report’s Column settings, you cannot hide or show each of these columns separately. You can only hide or show all the columns at the same time, by unticking or ticking the All gels box. Other examples of such grouped columns are the treatment conditions in the Anova table or in the Expression ratio table. Display ‘[ImageName]’ values – Choose this option to display the values from the selected column on all other images. As a result, all images will display the same label or color for a given spot. Display ‘All gels’/’All levels’ values – Choose this option to label or color the spots on each image with the values from their corresponding column. In other words, for a given spot, each image will display the value for the particular image. When your right-click on a column that is not part of a column group (such as ID, Mean or Fold), only the first option will be proposed. Choose Display ‘…’ values and then pick one of the Show label options to display column content as labels on the 2D view. These options are not avaible if only 3D views are displayed. Show label on all spots – Choose this option to show a label on all spots. Show label for selected spots (adaptive) – Choose this option to show a label on selected spots only. For instance, when you examine your spots in the Display area and only need the information on the spots of interest. Show label on presently selected spots (fix) – Choose this option to show a label on presently selected spots. Once your labels are shown, you can deselect the spots without the labels disappearing. This is useful when you only want labels on certain spots for publication purposes. Hide label – Choose this option to hide all labels. When labels are displayed, a label box appears in the report toolbar. You can click on the red cross on that box to remove the labels. You can also click elsewhere on the box to change the label settings. Select Display ‘…’ values and then choose Show as color to apply a desired color coding to the spots on your images and the values in the column(s). Spot color coding is possible based on numerical columns and spot sets. It is not available for annotations. Gradation – Use one of the automatic color gradations. Select one of the color options (3 colors, 2 colors, 1 color low, 1 color high). To change the default colors, go to the Colors tab in the General options and edit the colors in the Column as spot colors section. values – The color gradations are linearly distributed between the lowest and highest values in the column(s). These extreme values are shown at the left and right of the colored bar. ranks – The color gradations are linearly distributed over the ranks of the spots (spots are ranked by value). % – The color gradations are linearly distributed over the percent of the spots (spots are ranked by value). The colored bar in the Gradation section shows the proportion of spots having a specific color. It is not a view of the color palette applied. In the illustration below, the majority of spots have a low Fold change. 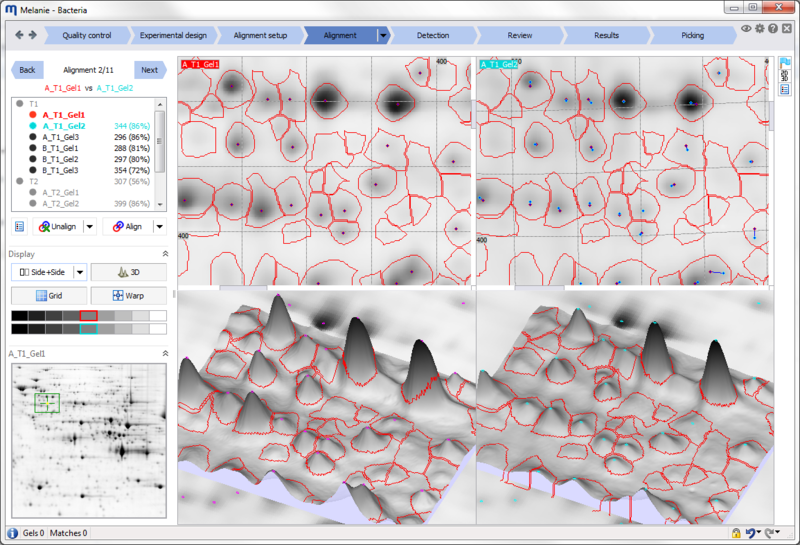 Therefore the values option shows a lot of pink spots and only few red spots (with high fold change). When using the ranks option, the white to red gradation is applied linearly to the value-ranked spots, so many more spots are colored red. A two color gradation based on ranks or % can be used to create heatmap-like representations, visually revealing interesting expression patterns, as shown for the Group table below. Thresholds – Set thresholds to color code your spots. Choose one of the threshold options (Low and high, Low, High). Specify one or two thresholds to define different color zones (the number depends on the threshold option): enter a value in the threshold box(es) at the top left and/or right, or by dragging the slider(s) between the different sections in the colored bar. values – This is useful when you want to color spots that have a value lower or higher than a specific threshold. ranks – This is useful when you want to color a specific number of spots at the low or high value ranges. 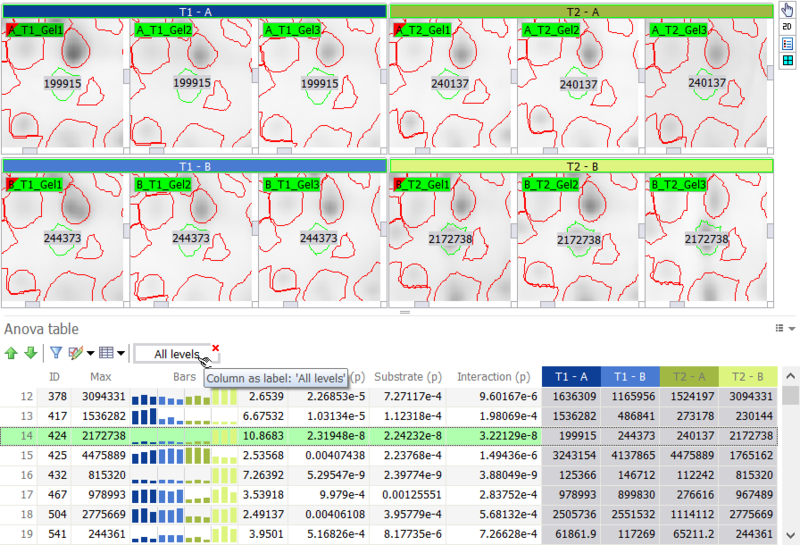 % – This is useful when you want to color a specific percentage of spots at the low or high value ranges. Gradation – Apply a color gradient to the spots in the section. Flat – Apply a uniform color to all spots in the section. Transparent – Make the spot shapes in the section transparent so the spots do not show. Use the threshold option in the Expression ratio table to easily color spots that are over- or under-expressed by a factor of two or more, compared to a reference treatment. In the figure below, spots that are under-expressed compared to treatment T1 – A appear in blue. Spots that are over-expressed show in red. Spots with expression ratios between 0.5 and 2 are transparent. Melanie offers a range of exporting features so you can easily share your project, save the project’s data or images for further analysis or publishing, and copy images to the clipboard for use in presentations or written reports. Click the Project icon at the top left of the screen and then choose Export to access these options. Export the Project to save all project-related files into a single compressed file with the extension .pex. Project exports are useful for regular archiving so you can recover your work at any time. They are also convenient to make a project available to colleagues so you can share the results. Export Data to save a table with all analysis results in Text format (.txt), as an Excel Workbook file (.xlsx) or an Excel 97-2003 Workbook file (.xls). You can use these files for further analysis of your data with third party software. For instance, when your experimental design is not specifically supported. This option is only avaible in the Review and Results steps. 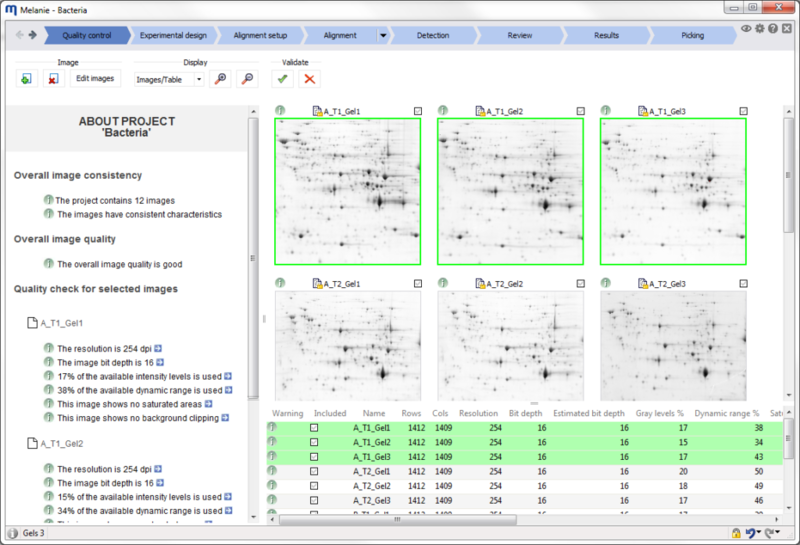 Choose Image to export one or several gel or blot images to PNG, BMP or TIFF format. Note that the resolution of your exported image will be proportional to the zoom factor in the Display area. Therefore, zoom in on your images if you need a high resolution export for publication purposes. Even if only a small part of your image is visible in the Display area, the entire image will be exported. Display area to clipboard – Copies the Display area to the clipboard. Image to clipboard – Copies the selected image to the clipboard. At any time, you can click the Image view icon at the right of your Workflow bar to enter the Image view mode. Here you can select a subset of your images for more in-depth visual exploration. 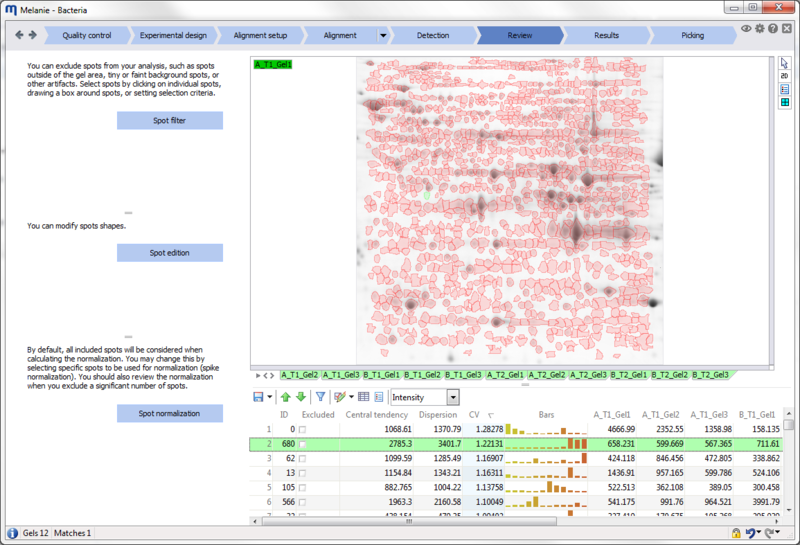 Examine gel images, spots and annotations using the Gel and Spot tables. Take a look at the list of keyboard shortcuts to help you become even more efficient.